There’s been a higher than usual level of activity on the AT-Sprint email list over the last few days as hints have emerged of a possible new offering of the popular MTR (Mountain Topper Radio) the latest of Steve Weber KD1JV’s radios that define the possibilities of ‘trail friendly’. To get a view of one in action check out this video from G4ISJ shot on a SOTA activation. 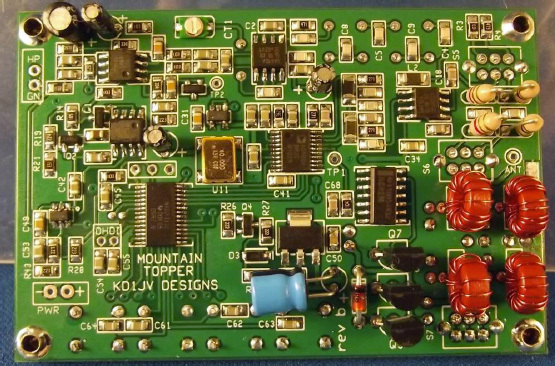 Steve KD1JV is the designer behind the PFR-3 and a number of other radios offered by Doug Hendricks’ QRP Kits along with the new Tri-bander Transceiver kit. But he also enjoys a passionate following for his high performance but tiny (Altoids tin size) radios in the ATS series where ATS stands for Appalachian Trail Sprint. These radios (especially the ATS-3B and the MTR) are prized by ham hikers and walkers who watch the ounces and milliamps. They are also an example of masterful interface design using small push buttons and minimal LED display. As Steve mentioned recently in a post reflecting his deep field operating experience “Little tiny rigs and knobs don’t work well together”. His website carries a pretty detailed three-page description of the design thinking behind the new rig which he’s calling the Super Deluxe Direct Conversion Transceiver. Tantalisingly he’s suggested it may be able to work at 500kHz. The new rig also features an “LCD frequency read out, built-in keyer and rotary tuning”. He’s planning to offer only 50 kits at about US$75 at the end of November. Expect to see them sell out in two minutes! I suspect if he offered 200, they might last an hour or two.